Want an awesome site on any device? Yes, we make that happen! As smartphone ownership surges, more consumers use them to access the web. As they do, researching services, buying products and socializing become more common. Developing a website that achieves its goals and takes advantage of the features of EVERY device involves far more than just making sure the site fits different screen sizes. In fact, most websites, even older ones will fit most screen sizes, but, on smartphones, the images, graphics and buttons are too small to be useful. Tilts, taps and pinching to zoom only leads to one thing: frustration! Good responsive design not only resizes your site but ‘rearranges’ it to keep the content: images, copy and action buttons, properly optimized for a magnificent user experience. In addition to our expertise in responsive design, our web designers and developers know how to design, layout and structure your site to get the most advantage from each device your site appears on, regardless of how big or small the display is. We believe website design goes beyond code and aesthetics. Your website should be a careful analysis of your location, target market and marketing plan. Designing a website requires the touch of an artist; someone with an eye for aesthetics. Our designers are some of the most creative people out there, with the ability to produce eye-opening visuals and pleasing graphics. Web design can be applied to any kind of website, be it static, dynamic, or flash-based. Clients are free to request website development with or without design. If you already have company logos, images, and/or color schemes that you want us to use, the design costs decrease considerably. If you do not, our designers can work with you to create the best look and feel for your company. If your company is new to the internet or you would just like a completely new look, this service is for you. We start from scratch, with our design team going to your offices, taking pictures, talking with managers, looking at logos and images, all to get the best feel we can for your company. From there, our team creates the various designs requested, trying to capture your company's personality online. If your company already has a website and you feel like things need a change or a more up-to-date look, this service is for you. 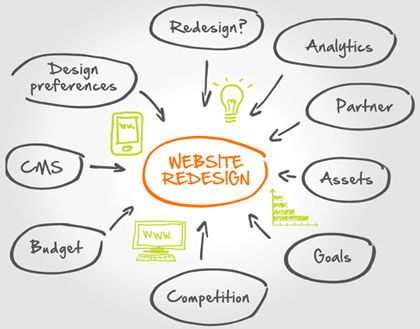 We take pre-existing websites and perform a visual overhaul. Our team of designers will go through your website with you, listening to your requests while also providing feedback from a design perspective on what works and what doesn't work. Take a look at our most recent Web Design Gallery!